In developing countries, water quality is something that often hampers progress. Proximity to water altogether is a threat to quality and something that led American social venture company Wello to create a portable water transporting device. In regions of India, the trek to water can be up to five miles long. Retrieving it is a task done mainly by women, and the distance can cause it to take up to 25% of their day. 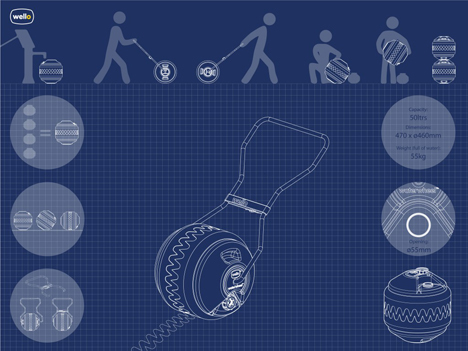 The inventors at Wello created the WaterWheel, a spherical container that rolls on attached handles. It can hold 50 liters, a five-fold improvement on the traditional head-carrying method. 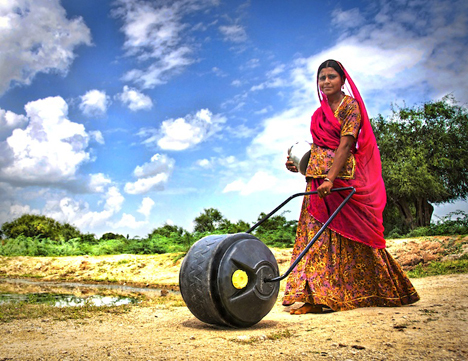 Wello created the WaterWheel after first visiting people in villages in the region of Rajasthan in 2011. They won a $100,000 Grand Challenges Canada prize that allowed them to fully develop the idea, which is now being manufactured in Ahmedabad city in Gujarat.